Sixteen year-old William Jenkins was on his second day of work when he was shot and killed during a robbery attempt in August of 1997. His father, Bill Jenkins, a professor of Speech and Drama at Virginia Union University, quickly found that there were virtually no resources which could answer his many questions as a survivor of a traumatic loss. He began looking for help and found it, after a fashion, scattered in the bookstores, on the Internet, and in support groups and agencies; but nowhere was there a single, concise, practical, and eminently useful resource for bereaved families containing the advice and guidance that he and his family needed following their loss. Several months later, using the information he had collected for his own personal well-being, this experienced teacher and speaker sat down to write the book that he should have received the night he was notified of his sons death. 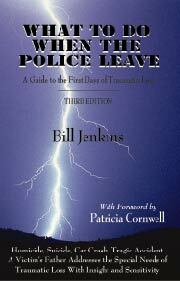 What to Do When the Police Leave: A Guide to the First Days of Traumatic Loss is a unique effort to redeem a tragedy. Now being released in a new and expanded Third Edition, this hopeful guide for surviving traumatic loss shares insights and practical advice born from direct experience in the trenches of grief and loss. Professional caregivers, service providers, and victim advocates contributed a wealth of information, but the perspective is profoundly personal and solely from the survivors point of view. Written in an easy to read style and format, and suitable for as wide a range of experiences and beliefs as possible, What to do When the Police Leave fills a valuable niche in the resources available to grieving families. It is receiving rave reviews from victim assistance and support programs across the United States and Canada. In this age of school shootings, road rage, suicides, and catastrophe this book is quickly becoming known as one of the most important resources available to families stricken with the sudden loss of a loved one. What to do When the Police Leave is distributed by In-Sight Books and is available through any bookstore. Single copies are $12.95 with bulk discounts available through the publisher for victim service organizations and providers. Copies are also available online through Amazon.com, Barnes and Noble Online, and other online booksellers, and through this website. Qualified members of the media or victim service organizations may request a complimentary review copy in order to prepare published reviews for newspapers, magazines, newsletters, or for broadcast with the understanding that a copy of the review will be forwarded to the publisher. Faculty members considering What to Do When The Police Leave as a text or supplemental text may order perusal copies here.